Every doctor will suggest you keep your weight in check. It is overall healthier as well as beneficial to lose excessive body weight. At times the general methods of weight loss such as dieting and regular exercising can help lose mildly excessive weight but in extreme cases of obesity certain surgical procedures are performed. These are called as ‘weight loss surgery’ and are performed with efficiency and affordability at Cocoona Center for Aesthetic Transformation in Delhi. Weight loss surgery is one of the efficient methods of removing excess fat from the body using certain surgical techniques and procedures. At times, when there is a mild amount of excess fat in the body it can be rid of by making certain changes in the diet to make it more healthy as well as regular physical exercise. However, in certain cases of extreme obesity, these methods prove to be inefficient in losing body fat and require other methods of fat removal. In such cases, the doctor may advise you to undergo a suitable weight loss surgery and to restore your health. What are the types of Weight Loss Surgeries? Thanks to the large advances in medical and surgical science there are now various different techniques and methods for performing successful surgeries. Some of these require the traditional ‘open-type surgery’ method while others are increasingly being done using ‘minimally invasive surgical methods’. 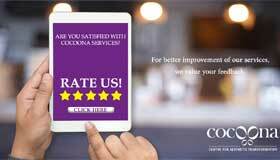 Cocoona Center for Aesthetic Transformation in Delhi regularly performs common and advanced weight loss surgical procedures with efficiency and continued success. These are called ‘restrictive’ as they work by basically restricting the amount of food intake by reducing the volume of the stomach. This surgery also slows down the digestion process significantly. Most restrictive forms of bariatric surgeries aim to decrease the volume of the stomach by around 1/3rd of the present volume. In the human body the small intestine in mainly responsible for releasing the digestive enzymes that help to break down the food and to absorb the resulting nutrients into it. In a malabsorptive bariatric surgery the surgeon will bypass most part of the major intestine so less amount of food is digested and at a slower rate which reduces the comparative intake of calorie per meal. What are the common types of Bariatric surgeries? Roux-en-Y Gastric Bypass surgery – This surgery requires the surgeon to create a smaller pouch from the upper portion of the stomach. Only this part of the entire stomach is restricted to receive the food. This restriction helps in decreasing the food intake as well. The surgeon will next reconnect the small intestine from the lower portion of the stomach and attach it to the upper restricted portion of the stomach. Another portion of the small intestine is still connected to the lower stomach for allowing the digestive enzymes to flow. Laparoscopic Adjustable Gastric Banding Surgery – This is one of the minimally invasive bariatric surgeries commonly performed at Cocoona Center for Aesthetic Transformation in Delhi. This is done by inserting an adjustable band-shaped implant around the mouth of the stomach on top just below the entry from the food pipe. This creates a small pouch from the upper portion of the stomach and the lower portion is connected to it through a very narrow (restricted) opening from the band. This band is connected to a small tube which is attached to a port on the outside of the tummy. The circumference of the implanted band is controlled easily by injecting or removing fluid through the port of entry. This is a minimally invasive restrictive form of bariatric surgery. Sleeve Gastrectomy Surgery – In this surgery, the expert surgeons at Cocoona will remove a major portion of the stomach from the digestive system, either by using fine sutures or surgical staples. The smaller portion is a continuous tube-like smaller stomach. This is a restrictive form of weight loss surgery which essentially reduces the size of your stomach significantly but does not affect the nutrient absorption. Biliopancreatic Diversion (Duodenal Switch) surgery – This is similar to sleeve gastrectomy. This involves removing a major portion of the stomach while leaving the upper part of the small intestine (duodenum) in place. The middle portion of the small intestine is closed off from the digestive circuit and the lower portion of the small intestine is reattached to the duodenum. This is the duodenal switch part of the biliopancreatic diversion surgery. Cocoona Center for Aesthetic Transformation in Delhi is increasingly becoming popular for providing the largest variety of successful and efficient weight loss surgeries. This advanced cosmetic clinic uses the latest in medical and surgical technology to perform a large number of successful weight loss procedures each month.